Friends, I’m happy to introduce you to a former classmate and newly-found friend of mine, Catie Joyce of www.theapproximateyogi.com. You will remember her as the person who taught me how to get rid of excess greens in my morning smoothies, and whose writing on Rebelle Society and Elephant Journal I’ve been sharing all summer. I’m so happy to have a guest post from her here. 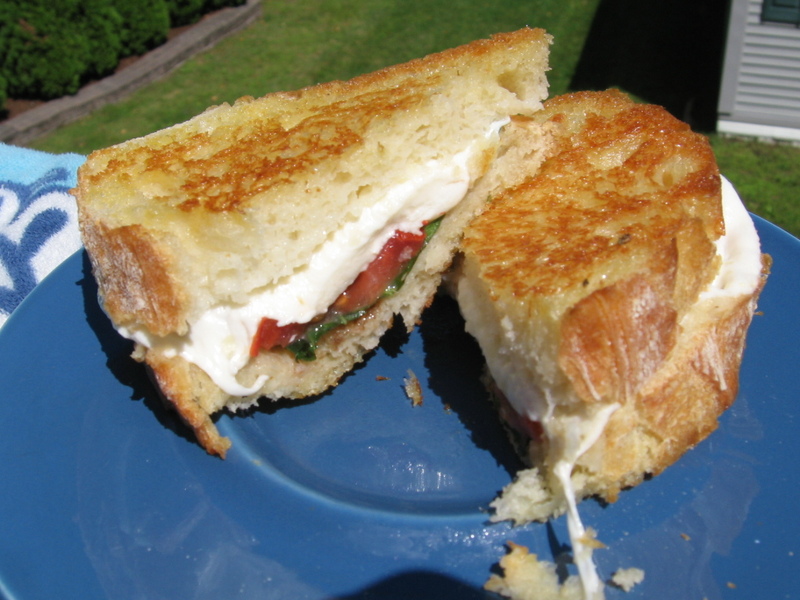 I plan to make this Caprese Grilled Cheese for supper tonight. Enjoy! I had this amazing idea for a decadent grilled cheese sandwich the other day. Luckily, I blog, so I had the perfect excuse to indulge. That, and I had a willing accomplice. Hence, the capresé grilled cheese sandwich was born. So for those unfortunate souls who have never had capresé, I’ll enlighten. It is the perfect summertime appetizer, so fresh, so elegant, and a perfect use of some really great garden ingredients. 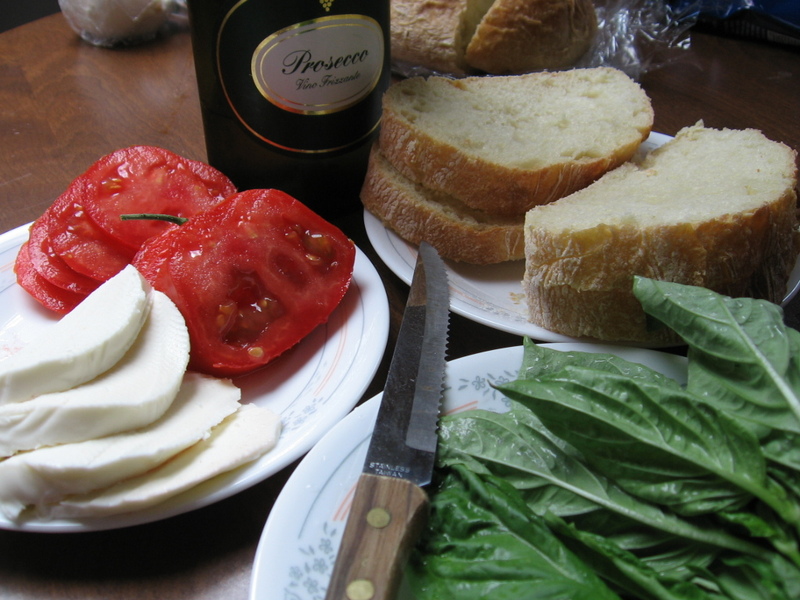 You start with a base of mozzarella, a nice round thick slice, add a slice of summer-ripe garden tomato, top it with a fresh basil leaf, then drizzle with olive oil and a good balsamic vinegar. Done. Place the whole thing in your mouth, and wait for your taste buds enter into heaven! Why not put this into a grilled cheese sandwich? I thought. (I think the original inspiration came from trolling Pinterest, looking at other grill cheese spin-offs.) So I did. You really can’t go wrong with grilled cheese anyway, but adding these extra ingredients, heating them up to make that mozzarella just ooze –heaven in a sandwich. Plus, with those fresh garden ingredients it is a little healthier than your average grilled cheese. 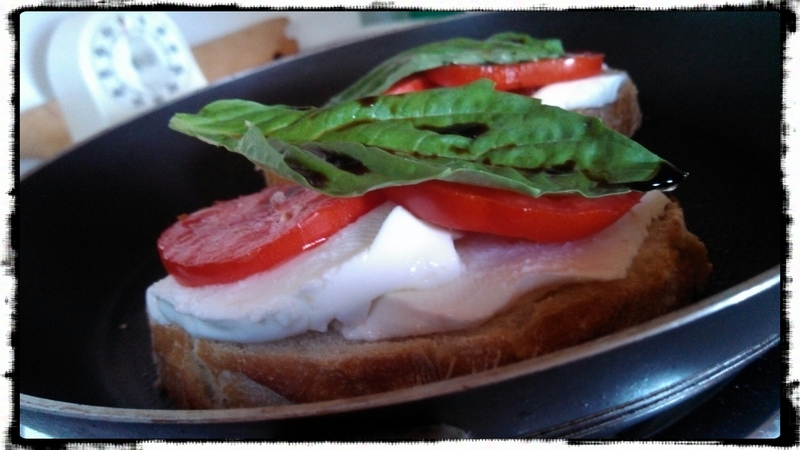 Slice everything up –bread, tomatoes, and mozzarella. Butter your bread slices on both sides (or just the outside if you want to reduce the fat). Place in hot frying pan that’s on medium heat. Add mozzarella, tomato, and basil leaf. Then carefully drizzle with extra virgin olive oil and balsamic vinegar. Salt if you’d like. Place other buttered bread slice on top of this. Cook for a few minutes, until bread has that lovely brown, toasted, melted-buttery quality, then flip and do the same for the other side. Now you’re ready to enjoy. It tastes best if you have the pleasure of sharing it with a good friend, and a view of a lake on a sunny afternoon, as I was fortunate enough to have. However, it will taste great on a rainy day as well. Previous Post Two Pics That Say Everything. Read my guest post on my friend’s lovely blog From Midnight Oil. 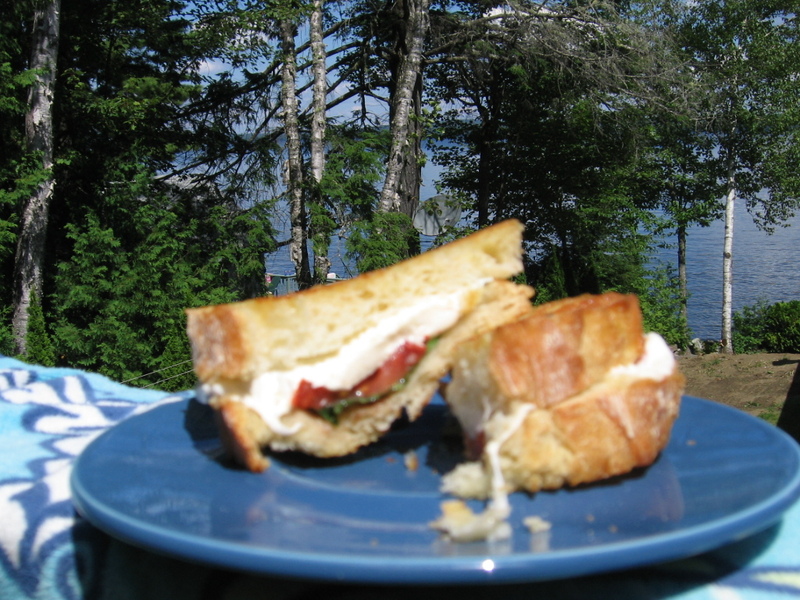 I love Capresé salad but have never tried it as a sandwich… inspired!